What a gorgeous day it was to be a wedding photographer of this beautiful couple! 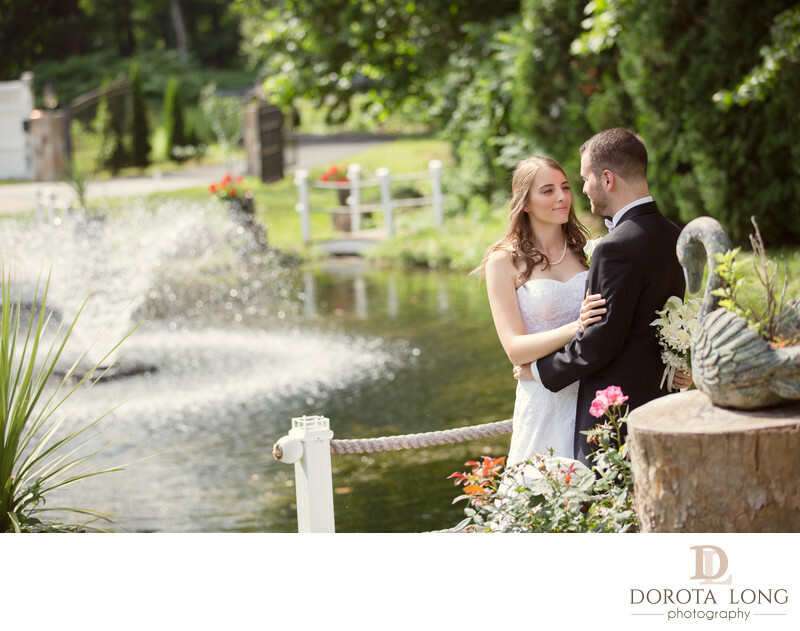 They got married at the venue called Villa Bianca located in Seymour, Ct. The venue had a nice park at the back where we took the wedding photographs of the wedding couple. There was a beautiful pond and a few bridges as well as a fountain right in the middle. For this photograph, I asked the bride and groom to stand on the bridge and look at each other. I also asked the groom to put his arm along the bride's waist and I asked the bride to put her hand comfortably on the groom's arm. I loved how they looked with the beautiful background they had. I actually really loved all the photographs taken that day. Not only the day was gorgeous but also the bride and groom were very good looking couple and so in love. The lens I chose to photograph this moment was 70-200 because I love background compression. The couple forgot I was there and was very natural in front of my camera. They were going along with my directions and all the photos turned out so beautiful! It was such an honor to travel from Danbury to Seymour to be a wedding photographer of these two.